Neither WFQ nor CBWFQ can provide guaranteed bandwidth and low-delay guarantee to selected applications such as VoIP; that is because those queuing models have no priority queue. Certain applications such as VoIP have a small end-to-end delay budget and little tolerance to jitter (delay variation among packets of a flow). LLQ includes a strict-priority queue that is given priority over other queues, which makes it ideal for delay and jitter-sensitive applications. Unlike the plain old PQ, whereby the higher-priority queues might not give a chance to the lower-priority queues and effectively starve them, the LLQ strict-priority queue is policed. This means that the LLQ strict-priority queue is a priority queue with a minimum bandwidth guarantee, but at the time of congestion, it cannot transmit more data than its bandwidth permits. If more traffic arrives than the strict-priority queue can transmit (due to its strict bandwidth limit), it is dropped. Hence, at times of congestion, other queues do not starve, and get their share of the interface bandwidth to transmit their traffic. Figure 4-6 shows an LLQ. As you can observe, LLQ is effectively a CBWFQ with one or more strict-priority queues added. Please note that it is possible to have more than one strict priority queue. This is usually done so that the traffic assigned to the two queues—voice and video traffic, for example—can be separately policed. 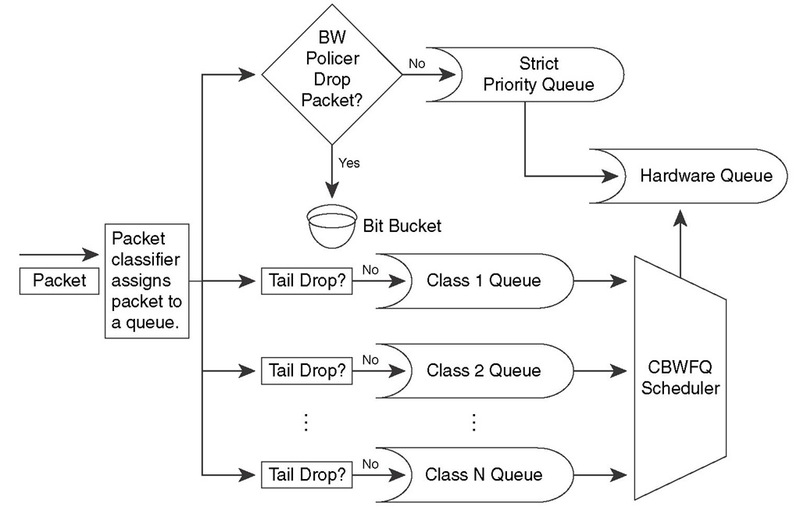 However, after policing is applied, the traffic from the two classes is not separated; it is sent to the hardware queue based on its arrival order (FIFO). As long as the traffic that is assigned to the strict-priority class does not exceed its bandwidth limit and is not policed and dropped, it gets through the LLQ with minimal delay. This is the benefit of LLQ over CBWFQ. LLQ offers all the benefits of CBWFQ, including the ability of the user to define classes and guarantee each class an appropriate amount of bandwidth and to apply WRED to each of the classes (except to the strict-priority queue) if needed. In the case of LLQ and CBWFQ, the traffic that is not explicitly classified is considered to belong to the class-default class. You can make the queue that services the class-default class a WFQ instead of FIFO, and if needed, you can apply WRED to it. The benefit of LLQ over CBWFQ is the existence of one or more strict-priority queues with bandwidth guarantees for delay- and jitter-sensitive traffic. The advantage of LLQ over the traditional PQ is that the LLQ strict-priority queue is policed. That eliminates the chance of starvation of other queues, which can happen if PQ is used. As opposed to the old RTP priority queue, the LLQ strict-priority is not limited to accepting RTP traffic only. You can decide and assign any traffic you want to the LLQ strict-riority queue using special IOS keywords, using access lists, or using Network Based Application Recognition (NBAR) options. Finally, like many other queuing mechanisms, LLQ is not restricted to certain platforms or media types. The burst amount (bytes) is specified as an integer between 32 and 2,000,000; it allows a temporary burst above the policed bandwidth. Note that if the percent option is used, the reservable amount of bandwidth is limited by the value of max-reserved-bandwidth on the interface configuration, which is 75 percent by default. Example 4-7 shows implementation of LLQ using a policy map called enterprise. 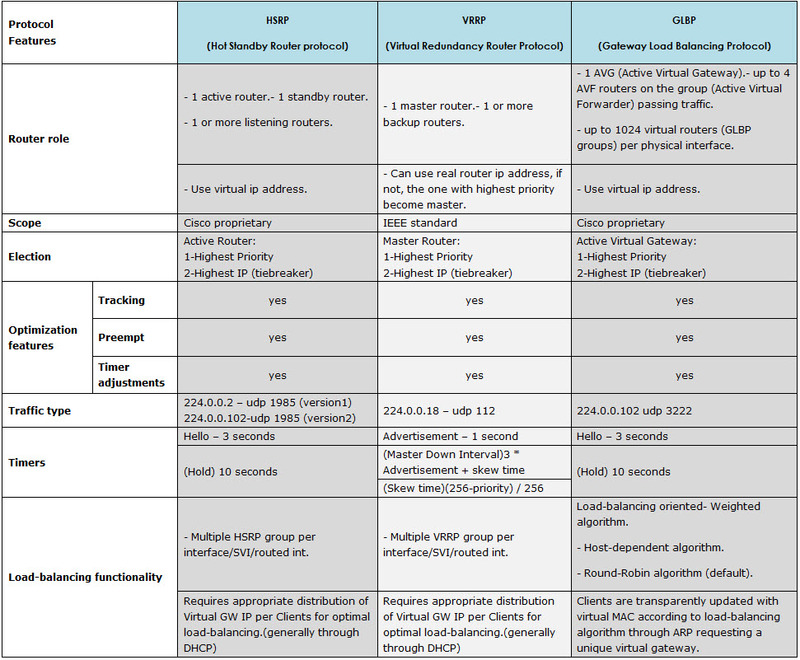 The policy map assigns a class called voice to the strict-priority queue with a bandwidth guarantee of 50 Kbps. Classes business and class-default form the CBWFQ component of this LLQ. You can use the show policy-map interface interface command to see the packet statistics for all classes used within a policy map that is applied to an interface using the service-policy command. Example 4-8 shows (partial) output of this command for the serial 1/0 interface of a router. Cisco QoS features like LLQ and CBWFQ let us to prioritize and guarantee delay and bandwidth for defined class of traffic. CBWFQ configuration allows to configure the BW requirements for specific class of service. First we have to defined the class and match the specific type of traffic, then assign BW limit in the policy that will be reserverd during interface congestion. Standard bandwidth command with BW in Kbps under class can be used for above. The drawback of this type of configuration is need to adjust the BW speed definition each time once we have changed the access speed. IOS allows to tune the QoS configuration to define kind of QoS template that will use BW class ratio accross function similar devices without need for reconfiguration of BW parameters each time when access speed change. LLQ defines the priority queue for the delay sensetive traffic. Additionaly for business critical traffic CBWFQ needs to be configured. We have two options to confgure the QoS template: bandwidth percent and bandwidth remaining percent per class options. I have defined 4 classes that will be used to presents configuration options. First option to define BW template is to use bandwidth percent command instead of just bandwidth under class in policy map configuration. BW will be calculated based on the interface’s BW, so in case Fast Ethernet it will be 100Mbps. Priority percent 10 for PQ or bandwidth percent 10 in CBWFQ it’s 10% of 100Mbps. By default, available interface BW is defined based on the physical port speed unless you configure the bandwidth command under interface to set access speed to something less (SLA access). Additionaly Cisco IOS has Default Class (class-default) with reserved the 25% of interface BW that match all undefined traffic (you can change it with max-reserved-bandwidth command under interface mode). We can observe the error message that is saying that we have just 5% of available BW, this is due to 25% reserved for default class. OK so let change reserved BW for TELNET to 5%, assign policy to the interface and see the policy. Second option to define BW is to use bandwidth remaining percent command. The idea of this type of configuration is to first reserve the BW for the PQ thru priority percent command and next divides the available remaining BW between defined classes. For class VoIP priority percent 10 will be equal 100Mbps*0,1=10Mbps, BW Remaining is = (100-10)Mbps * 0,75= 67,5Mbps. So BW Remaining will be used as reference for all classes. For class HTTP bandwidth remaining percent 10 will be equal BW Remaining*0,1 = 67,5Mbps*0,1= 6,75 Mbps. For class SMTP bandwidth remaining percent 50 will be equal BW Remaining*0,5 = 33,75 Mbps. For class TELNET bandwidth remaining percent 40 will be equal BW Remaining*0,4 = 27 Mbps. Above examples are Cisco recommended ways to deploye CE QoS configuration for different access speed port. The other ISDN access available is the Primary Rate Interface (PRI), which is carried over an E1 (2048 kbit/s) in most parts of the world. An E1 is 30 ‘B’ channels of 64 kbit/s, one ‘D’ channel of 64 kbit/s and a timing and alarm channel of 64 kbit/s. In North America PRI service is delivered on one or more T1 carriers (often referred to as 23B+D) of 1544 kbit/s (24 channels). A PRI has 23 ‘B’ channels and 1 ‘D’ channel for signalling (Japan uses a circuit called a J1, which is similar to a T1). Inter-changeably but incorrectly, a PRI is referred to as T1 because it uses the T1 carrier format. A true T1 (commonly called “Analog T1” to avoid confusion) uses 24 channels of 64 kbit/s of in-band signaling. Each channel uses 56 kb for data and voice and 8 kb for signaling and messaging. PRI uses out of band signaling which provides the 23 B channels with clear 64 kb for voice and data and one 64 kb ‘D’ channel for signaling and messaging. In North America, Non-Facility Associated Signalling allows two or more PRIs to be controlled by a single D channel, and is sometimes called “23B+D + n*24B”. D-channel backup allows for a second D channel in case the primary fails. NFAS is commonly used on aT3. PRI-ISDN is popular throughout the world, especially for connecting PBXs to PSTN. Even though many network professionals use the term “ISDN” to refer to the lower-bandwidth BRI circuit, in North America BRI is relatively uncommon whilst PRI circuits serving PBXs are commonplace. In the United Kingdom, British Telecom (BT) provides ISDN2 (BRI) as well as ISDN30 (PRI). In ISDN, there are two types of channels, B (for “bearer”) and D (for “data”). B channels are used for data (which may include voice), and D channels are intended for signaling and control (but can also be used for data). There are two ISDN implementations. Basic Rate Interface (BRI), also called basic rate access (BRA) — consists of two B channels, each with bandwidth of 64 kbit/s, and one D channel with a bandwidth of 16 kbit/s. Together these three channels can be designated as 2B+D. Primary Rate Interface (PRI), also called primary rate access (PRA) in Europe — contains a greater number of B channels and a D channel with a bandwidth of 64 kbit/s. The number of B channels for PRI varies according to the nation: in North America and Japan it is 23B+1D, with an aggregate bit rate of 1.544 Mbit/s (T1); in Europe, India and Australia it is 30B+1D, with an aggregate bit rate of 2.048 Mbit/s (E1). ISDN2 is also called Basic Rate Interface or BRI for short. ISDN30 is also called Primary Rate Interface or PRI for short. ISDN30 has a minimum installation of 8 channels. ISDN2 doesn’t have a maximum number of channels, but rarely goes over 8. This is because at 8 channels, ISDN30 becomes cheaper. The only exception might be in more remote locations where ISDN30 isn’t available. So typically if you want 2/4/6/8 channels you’ll go for ISDN2, if you want 8 or more channels you’ll go for ISDN30. Simple*. The functionality of ISDN2e and ISDN30 is very similar. ISDN2e is supplied in multiples of two lines. You can expand further in multiples of two, but each expansion requires a visit from BT (two week lead-time) plus system programming. If you require 6 lines or less on your telephone system and it is likely that this figure will not increase, then ISDN2e is usually adequate. For larger organisations, the correct solution is ISDN30. ISDN30 is delivered as ‘a site connection’, you merely specify how many lines you want (eight is the minimum). One advantage of ISDN30 is the use of fibre optic cable, which is more reliable than traditional copper wire. (note ISDN30 is quite often now supplied on copper).